Global yeast market expected to reach approximately USD 8,940 million by 2026 and is expected to exhibit a CAGR of around 9% between 2018 and 2026. The key factors -that are triggering the growth of the yeast market include increasing demand for convenience products and rising nutritional benefits of the yeast. The report covers forecast and analysis for the yeast market on a global and regional level. Market opportunities are discussed in detail in the report. The report also includes historical data from 2014 to 2016 for the global yeast market. The key target audience for the market has been determined in the report. The demand generated by the yeast market in terms of volume is represented in kilotons. The market numbers have been calculated using top-down and bottom-up approaches. The yeast market has been analyzed using Porter’s Five Forces Analysis. “Pricing Analysis” is also included in this report which covers pricing by type, application, and forms for all the 39 countries that are included in the report. The market is segmented on the basis of type, application, and form which, in turn, are bifurcated on regional and country level as well. The report deals with the in-depth quantitative and qualitative analyses of the yeast market. Around 23 countries are covered under Latin America yeast market. Yeasts are unicellular fungi. They have completely different properties from bacteria. Yeast is majorly used in the production of ethanol owing to its ability to ferment sugar. Baker’s, brewer’s, wine, bioethanol, feed, and nutritional and supplement yeast are the major type of yeasts which are widely used in food and beverages and feed industry. 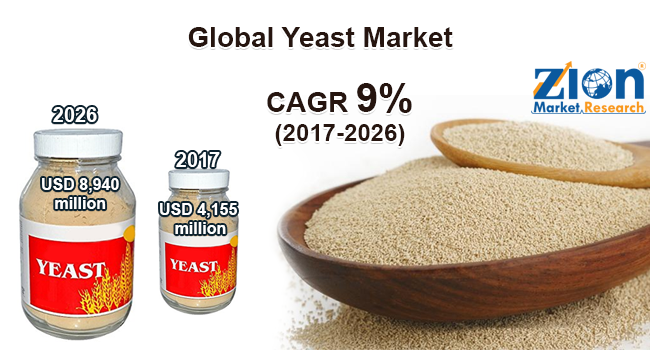 The yeast market was valued at around USD 4,155 million in the year 2017 and it is expected to reach approximately USD 8,940 million by 2026. The global yeast market is expected to exhibit a CAGR of around 9% between 2018 and 2026. The volume of the global yeast market in 2017 was around 1,120 kilotons and it is expected to reach approximately 2,220 kilotons by 2026 with an expected CAGR of around 8% during the forecast period. The major factor driving the growth of yeast market is the increasing consumption of fast food such as bakery products, pizza, etc. owing to the changing lifestyle pattern in developing countries. Moreover, the increasing awareness about nutritional benefits of yeast is expected to significantly boost the growth of yeast market in the coming years. Yeast is ideal for a vegetarian diet and its nutrients are beneficial for healthy hair, nails, and skin. The selenium-enriched yeast is antioxidant in nature and protects human cellular constituents against oxidative stress. The yeast is full of minerals such as chromium, copper, zinc, selenium, etc. and vitamin B thus they help to compensate for nutritional deficiencies. However, unavailability of suitable raw materials required in the production of different yeast types may hamper the growth of yeast market in the coming years. The bioethanol yeast segment is expected to register the highest CAGR of more than 11% during the forecast period. Bioethanol consumes low carbon and it is eco-friendly in nature. The increased demand for the bioethanol as a fuel is expected to propel the growth of segment in the coming years. The Baker’s yeast segment accounted for a major share in the yeast market in 2017. The increasing consumption of fast and processed food such as bread, pizza, and other bakery products owing to changing lifestyle is expected to propel the growth of the segment over the forecast period. The brewer’s yeast segment accounted for a significant share in the global yeast market and is expected to register significant growth rate during the forecast period. The brewer’s yeast contains nutrients such as protein, vitamin B, zinc, potassium, magnesium, etc. The increasing demand for healthy yeast and rising demand for alcoholic beverages is expected to propel the growth of the brewer’s yeast market globally. The food and beverage segment is expected to register the highest CAGR of around 9% between 2018 and 2026. The segment accounted for the more than 80% revenue share in 2017 in the global yeast market. The feed and others segment anticipates registering a significant growth rate over the forecast period. Increasing consumption of feed containing yeast by the animals is expected to propel the growth of the segment in the forecast period. Europe accounted for the highest share of more than 30% in the global yeast market in the year 2017. The high consumption of processed food and growing demand for nutritional yeast are the major factors contributing towards the growth of the market in this region. The Asia Pacific is expected to register the highest CAGR of around 9% in the global yeast market. The increasing demand for baked food products, changing lifestyle, urbanization, growing consumer preference for natural ingredients and the increasing use of organic yeast in the food industry are the key factors boosting the growth of yeast market in the region. The report includes detailed profiles of the prominent market players that are trending in the market. The list of the players that are compiled in the report are Nutreco N.V., Oriental Yeast Co., Ltd., Pacific Ethanol, Inc., Synergy Flavors, Inc., Leiber GmbH, Koninklijke DSM N.V., Lallemand Inc., Alltech, Inc., Angel Yeast Co. Ltd., Archer Daniels Midland Company, Cargill, Incorporated, Chr. Hansen Holding A/S, Kerry Group Plc., Associated British Foods Plc., Bio Springer S.A., Biomin Holding GmbH, Lesaffre, LEVAPAN, and Sensient Technologies Corporation, among others.